Revel in the day as L'eau Du Caporal surrounds you with the sweet scents of nature. 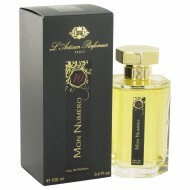 This fragrant wo..
Mon Numero 10 perfectly blends sweet and mysterious notes for a fragrance that is alluring and capti.. Launched by L'Artisan Parfumeur in 2002, Safran Troublant is a sweet, spicy scent for the woman who ..
Indulge your wanderlust with Tea for Two by L'Artisan Parfumeur. Decidedly exotic and sensual, this ..